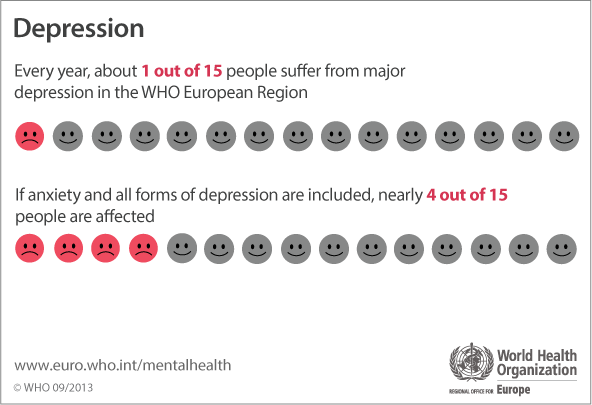 Each year, a quarter of Europeans suffer from depression or anxiety . It costs the EU economy about €170 billion per year , according to the World Health Organization (WHO). At the same time, over 50% of Europeans are overweight , and around 23% of women and 20% of men are obese. One in three 11-year-olds in Europe are overweight or obese. Health organizations recommend a raft of measures to combat obesity, including introducing a colour-coded nutrition labelling system that points consumers to healthier options and monitoring food and beverage marketing . According to a new report , people living close to trees and green spaces are less likely to be obese, inactive, or dependent on anti-depressants. The report also looked at research on early childhood. It found that, for instance, babies born in areas with surrounding greenness have a higher birth weight and head circumference . And children living within 5km of diverse natural environments, such as forest areas and farms, were less likely to develop an allergy . Elsewhere, studies have shown that the Japanese practice of ‘ forest bathing ’ (spending time around trees) is scientifically proven to improve your health. Nature can also help to improve memory. Scientists at the University of Michigan tested the effect of walking through either a natural environment or down a busy street. The former showed better memory recall .